When you have foot and ankle pain, you want answers to your concerns fast. Browse through our collection of answers to frequently asked questions. Our hope is that you will find the information you need to get relief for your foot and ankle pain in Pennsylvania. What is the proper way to care for my feet if I have diabetes? Diabetes touches every area of your body, including your lower limbs. Elevated sugar levels damage your blood vessels, which in turn hurts the organs, nerves, and other tissues throughout your body. Your feet are one of the first places to feel the effect, and remain at high risk for sustaining serious complications as result. A diabetic foot involves some degree of nerve damage and an increased risk of infection, so you need to take extra precautions to protect and clean your feet. Inspect your feet every day, and seek care as soon as possible if you do get a foot injury. A yearly check-up with your podiatrist here at Martin Foot and Ankle helps ensure you stay on track with your basic foot health, as well as look for any issues that you may not have noticed. Be more active. Exercise regularly to help improve blood flow to your lower limbs. Keep the blood flowing to your feet. Put your feet up when sitting. Wiggle your toes and move your ankles several times a day. Don't cross your legs for long periods of time. Protect your feet from extreme hot and cold. Wear shoes at the beach or on hot pavement. Don't put your feet in hot water without testing it first. Never use hot water bottles, heating pads, or electric blankets. It’s easy to burn your feet without realizing it. Wear shoes with sufficient padding and support. Don’t walk around barefoot. Use shoes or slippers to act as protection between you and objects that could cut or irritate your feet and lower limbs. Don’t smoke or consume too much alcohol. That can have a negative effect on your circulation that your body can’t afford. Use warm - not hot - water to wash.
Use a mild soap and pat the feet dry, rather than rubbing. Take the opportunity to check for problems you may not feel, like cuts, bruises, sores, lumps, bumps, distortions or discolorations in the skin or nails, or any other unusual changes. Use a mirror, or ask someone to help, to check the bottom of your feet, too. Clip your toenails straight across, so the edges are left intact. Use a lotion or ointment to keep your skin moist. Don’t apply lotion between toes. If you do notice any changes, or you experience any discomfort in your lower limbs, contact Martin Foot and Ankle immediately. That way any problems that do arise can be addressed before they have a chance to get out of hand. If you have diabetes, you need to be intentional and work with a health team - like you’ll find here at Martin Foot and Ankle - to monitor and manage your health and your foot-related symptoms. Visit our contact page or call us at (717) 757-3537 for more information or to schedule an appointment at our York, Hanover, Lititz and Lancaster podiatry offices. Why won’t wounds on my feet heal? There are several reasons an open wound or sore on your foot isn’t healing. By far the most common underlying problem preventing a foot wound from healing is poor circulation. When blood flow to your feet is reduced, your tissues don’t get as much oxygen. Cell metabolism slows down, which reduces your body’s ability to close the wound and fight off infection. Foot wounds are commonly associated with diabetes, since slow circulation is a very common diabetic complication. However, other risk factors include smoking, high blood pressure, high cholesterol, obesity, age, and even certain medications. If a wound won’t heal, it’s important to get professional treatment immediately. Otherwise, you risk contracting an infection that could spread and ultimately require an amputation. To schedule your appointment with Martin Foot & Ankle, please call (717) 757-3537 today. How important is my yearly diabetic foot exam? Trust us: you don’t want to skip your yearly diabetic foot exam! The biggest threats to long term foot health among those with diabetes are nerve damage (peripheral neuropathy) and circulatory problems (peripheral arterial disease). Although the “immediate” cause of a diabetic ulcer might be a specific cut or injury, neuropathy and circulatory problems are what make small injuries so potentially devastating in the first place. Neuropathy and peripheral vascular disease are tricky for a couple of reasons. First, they develop and progress slowly over time, and second, they are very difficult (if not impossible) to reverse. Treatment is focused mostly on managing symptoms and keeping them from getting worse. By the time you notice them, you can stop the ship, but it may be too late to fully change course. Yearly diabetic exams allow us to test for neuropathy and circulatory problems to stop them in their tracks as early as possible, before they have a chance to severely impact your life. We can also help you correct contributing foot problems and manage risks by helping you with shoes, corns and calluses, foot pain, and other issues. If it’s time—or past time—for your yearly diabetic foot exam, don’t wait any longer! Pick up the phone and connect with Martin Foot & Ankle today at (717) 757-3537. How is my physical therapy progress measured? During your first visit to Martin Foot & Ankle, you’ll spend about 60-75 minutes one-on-one with a physical therapist. In that time, your therapist will ask you to perform various tasks and exercises to complete a thorough evaluation of your lower extremity function. This establishes baseline measurements in areas such as strength, range of motion, balance, and more. After that, we spend time discussing these result with you in detail—along with why you’re getting those results and what you need to do to improve them. At this time you and your therapist will set a list of goals, and your therapist will put together a program to help you get there. In subsequent sessions, your progress will be measured against the baseline evaluation from your first appointment, as well as your progress toward achieving your personal goals. If you have an injury or other limitation preventing you from reaching your activity goals, talk to the licensed professionals at Martin Foot & Ankle. Give us a call today at 717-757-3537, or fill out our contact form online. When you come to physical therapy for your lower limbs, you know you’re going to be moving, stretching, and exercising. Your physical therapist also needs to be able see how your muscles, tendons, and joints are moving and interacting so that he or she can evaluate your level of function. For more information on what to expect from physical therapy, or to schedule an appointment, please call Martin Foot & Ankle at (717) 757-3537 or complete our online contact form. Can I strengthen my ankles on my own? It is certainly possible to strengthen ankles on one’s own. Simple exercises can be performed on a daily basis that can build ankle strength over time, which can help prevent injuries and chronic instability through the future. Before starting any form of exercise regimen, however, we do recommend consulting with one of our experts here at Martin Foot & Ankle first to determine the best and safest route to benefit you. This is especially true if you have any current ankle problems or have had ankle injuries in the past. It is best not to risk starting out with certain moves that might place you at a higher risk of falling or injury before you are prepared for them. Contact us at one of our offices in Hanover, Lancaster, Lititz, or York by calling (717) 757-3537 or submitting a request through our website. From yoga poses to band stretches, our physical therapists can help guide you on the best path to better ankle health. 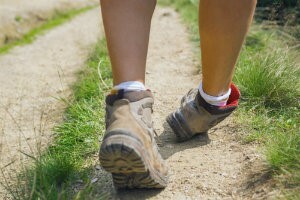 Why does my ankle give out when I walk? Ankle instability often arises after someone sustains an injury to the ankle. Although an injury may feel healed, there may still be some permanent damage to the ligaments and/or nerves surrounding the joint. This may happen if the injury does not fully heal or if the area has not been properly rehabilitated. In other cases, it may happen regardless of best treatment and practices. When an ankle is more likely to give out, the chances of further injury increase, which can lead to further instability and pain down the line. If an ankle has not suffered from any injuries in the past, other neuromuscular conditions might be responsible. If you are suffering from ankle instability, there are ways to help support and strengthen the joint. Contact the experts at Martin Foot & Ankle by calling (717) 757-3537. Our four offices in Hanover, Lancaster, Lititz, and York are ready to help. How long should my child rest before returning to activities? In the case of children's sports injuries to the foot and ankle, it is always wise to follow the advice of your podiatrist in determining when it is best to begin returning to activities. In some cases, trying to resume activity to soon can result in re-injury and chronic pain or weakness. It might also be essential to resume activity slowly or after physical therapy to condition the bones and muscles back to their prior strength. In more minor cases, however, a child should maintain rest of an injured foot or ankle until he or she is able to demonstrate that they can resume activities without pain, and no sooner. The child should be able to walk and run without any sense of pain or showing any form of a limp. The doctors at Martin Foot and Ankle are happy to advise you on your child’s recovery. Call (717) 757-3537 to schedule an appointment at our offices in Hanover, Lancaster, Lititz, or York. Should I apply heat or ice to a child’s foot injury? Heat or ice for an injury is a question that has prevailed through the ages, but both have their benefits for your child in certain situations. Cold constricts blood flow by narrowing blood vessels. This makes it an effective tool for helping to reduce inflammation from your child’s foot injury within the first day or so of it occurring. Allowing inflammation to run unabated will increase pain and swelling, which makes it more miserable for your child. A good way to tell if an injury can benefit from ice is whether it feels overly warm to touch. Heat is a sign that inflammation is ongoing. Heat therapy on the other hand, increases blood flow. It tends to be most effective after inflammation begins to decrease and nutrients can be brought in to help the healing process. Sometimes, however—and especially with children—you’ll want to go with what feels better for them. If ice continues to keep them happy after a few days, let them continue with it. Just make sure not to expose their skin to either extreme of temperature for too long. For advice on home treatment and pain relief, the doctors at Martin Foot and Ankle can help. Contact our offices in Hanover, Lancaster, Lititz, and York, PA by calling (717) 757-3537. Why does it feel like I have a pebble in my shoe? The feeling of a pebble or a bunched up sock can be a symptom of a Morton’s neuroma. This condition is defined by the swelling and thickening of tissue surrounding one of the nerves leading to a toe. The most common site for a neuroma in the foot is between the third and fourth toes. The swelling is typically located where the nerve passes beneath the ligament connecting all the toe bones in the forefoot. Any kind of irritation, trauma, or excess stress in that location can lead to the neuroma developing. In addition to the annoying feeling of walking on something, a neuroma may cause a burning or sharp pain within the ball of the foot. The toes might also become affected with burning or stinging pain, or even numbness. There usually isn’t any sort of visible sign (lumps, bumps, etc. ), however. If pain in the ball of your foot is making movement a bother, the doctors at Martin Foot and Ankle are the experts in treatments for neuroma and other sources of foot discomfort. Call (717) 757-3537 to schedule an appointment in one of our offices in Hanover, Lancaster, Lititz, or York.